The Christ in Prophecy Journal: Christian Doctrine: Learn Discernment? How can a Christian be discerning about doctrine? Eric Barger: In Matthew 24:3, the disciples come to Jesus and asked Him, "What will be the sign of your coming and of the end of the age?" Jesus in his reply didn't immediately go into a long dissertation about watching for this and this and that and talking about prophecy to them. The first thing He says in verse four is, "Watch out that no one deceives you." This should stand out as red lights to us as we read all over His Word. "Watch out that no one deceives you." Paul warned his followers of the same thing, to look out that we are not deceived. Believers in Christ must hold up the Bible and look at what is being called "Christian," let alone what the world is accepting, to see if it matches up to what the Scriptures say. I always tell people test me and everybody else that comes along teaching them the Bible, every word. Dr. Reagan: All of us, yes. Paul complemented the Berean's on testing him and he was an apostle. Eric Barger: That's right. Paul said in Galatians 1 that even if an angel from Heaven or himself should come and preach something different than what he'd already taught them, then don't believe it. He was saying what he had already taught them what was the truth and that it wasn't going to change. They were to test everything by what was initially taught about the Gospel from Christ. To be discerning you've got to know the Word. That is the problem today. Our teachers, our leaders, our theologians, our pastors, we need these people in those places and positions who revere and respect the Word and hold it in the highest regard imaginable. Nathan Jones: I have people write in often saying that they have seen their church of 20 or 30 years go from being a solid church doctrinally to just teaching fluff and butter. They want to know, should they stay there and be a light to that church or should they leave? Eric Barger: That is a great question. I have a DVD message called Divorce from Church: How Apostasy Scatters the Sheep. I deal with that question in it. One of the things I advise in there is if you really believe you can bring theological reform in your church, then stay there and try to bring reform. However, if you have young children or others who are being effected in a wrong way by what it being taught there, or not being effected in their spiritual life correctly, then you have a responsibility first and foremost to lead your family in the things of God. There are a lot of people in that shape in the stack of hundreds of emails I get as well who are dealing with this very dilemma. These are people who have written and said, "Our church used to believe in the Bible, but now we don't." I had a call from a fellow who is a theologian and has earned his doctorate as a Bible teacher teaching in a theological institution, one that I'm acquainted with. He told me he was basically in exile from his denomination because he had made a stand on the Word of God and they decided not to follow it. If I named it you'd recognize it as one of the great evangelical denominations that has been known for their standard of holding on to the Word of God. Dr. Reagan: What is the difference between tolerating differences of opinion and tolerating false doctrine, because I may disagree with you on some aspect of Bible prophecy? Or, maybe we disagree on how often one should take communion and that sort of thing. But, those are matters of opinion aren't they? Eric Barger: They are. They are what I call peripheral doctrines. They are around the edge. These are doctrines we need to have positions on and they are important, but they are not so vital that they are in for example the Apostles' Creed. They would not be a Heaven or Hell drop dead issue. They're not something that we have to believe to be Christians. But, there are certain doctrines of the faith like the Virgin Birth, blood atonement, salvation by grace, deity of Christ and many of those doctrines that we must believe in order to call ourselves Christians. Now, anybody can call themselves a Christian, but those are the doctrines that make up authentic Christianity. With those other non-essential doctrines, people love to talk about them, but we shouldn't want to break fellowship with them or anybody else. I think we ought to have our positions, but they aren't issues that effect your's and my eternity. 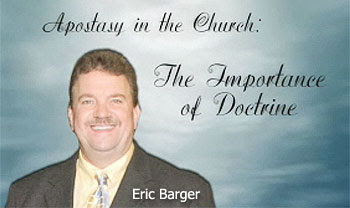 In the next part of this series on the importance of Christian doctrine, we'll ask Eric what exactly the core doctrines of the Christian faith are. It is so true that discernment is needed in order to stay faithful to the Gospel of Christ. However, I find the changes in a church I attended to be very subtle.For example no more Sunday night services, no cross in the sanctuary, study of what Islam is on Wednesday nights. All done over a period of three to five years. And all with very well grounded reasons for the changes. I see the emergent fingerprint in all this,others aren't even aware. So discernment comes from knowing the Word of God and having a personal relationship (having a lamp of oil vs not). The changes in the churches like the old story about the frog that jumps out of a hot pot of water when put in but if in the water as it heats up doesn't jump out because 'use to it'. Where are the teachers and preachers? I'm just a regular person trying to learn about the Lord by attending with others. That is not possible now because of even the 'elite' lack of discernment. The sheep are lost and we need the true sheperd. Jesus needs to come quickly. God Bless and thanks for listening to this rant.